Casper Mystery Mirror - Read Reviews & Play NOW! 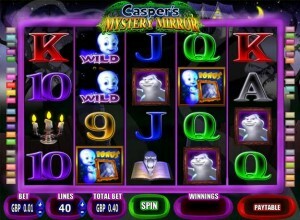 Step 1 – Bets on Casper's Mystery Mirror Slots can be made by adjusting the +/- counter labelled stake on the menu. Step 2 – With over forty win lines to choose from in Casper's Mystery Mirror Slots, it is imperative that you select how many you wish to activated in your game. You can do so by clicking on the +/- lines button on the menu. Step 3 – There is an auto play button available if you wish to play the same bet each spin, if not simply clicking on the spin button will begin play. There are so many Casper themed games both on offline and online bingo sites, but the Casper's Mystery Mirror slot machine is unlike any of them. It is a gambling game for a start. With five reels to help you win, what was once a game for children has evolved into an adults only online casino game. Exclusive to the Casper Mystery Mirror game are ghostly symbols and icons spread across the five spinning reels. You'll win if you match up a winning combination, all of which are listed on a pay table across the five reels. Casper himself acts as a wild card, which can be substituted for any other icon, except for the scatter card. The mystery mirror icon represents this slot games scatter card, but is only available in the free spins round. In Casper's Mystery Mirror Slots, gathering three Casper icons also triggers some free spins as well as being used as wild cards. The mystery mirror icons are activated during the free spins round, and gathering a number of them will multiply your bet significantly. You can also win free spins in the free spins round, although a maximum of 255 are available. Despite the game having a 95% payback rate over the long term, it is always beneficial to play Casper's Mystery Mirror Slots free on the Lord Bingo demo to learn the game, so that when it comes to coughing up your dough, you'll at least have some idea of what you are doing!